"30458 Grill Masters” was founded in 2004 from the desire of Keith Edenfield and Rusty Schol, to bring you great tasting grilled food and Bar-B-Que. They do so on their custom built grills and by preparing the food using their own seasonings, rubs and marinades, then by grilling it or slowly smoking it to perfection. They finish it off with their own BBQ sauce if you so desire. Picnics, Family Reunions, School Events, Sporting Events, G.S.U. Sororities Events, Graduation parties, Wedding receptions, Local Relay for Life Events and they have grilled at the Bulloch county fair. “30458 Grill Masters” have participated in several K.C.B.S. 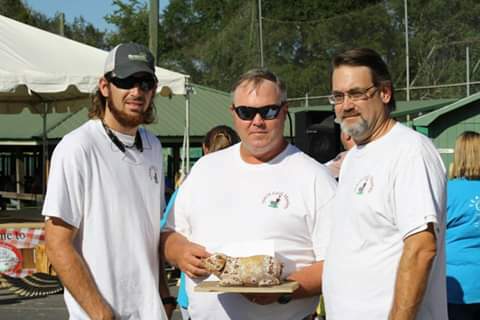 grilling competitions in southeast Georgia as well as in Florida and have come in the top five in all the events thus far. 30458 Grill Masters BBQ Competition Team is a team of three guys who have come together based on one passion, barbecuing! The teams consists of Keith Edenfield, Nicholas Edenfield and Rusty Schol, all from Statesboro, Ga. These guys have linked together to create the best pulled pork, ribs, and chicken you will ever eat​.